Back in February I got my Raspberry PI2 and wanted to do something with it. So I created a setup that made it display my heart rate as measured by my Microsoft Band, making it blink a colored LED in the same rate as my heartbeat. Windows 10 IoT Core wasn’t available at that time, which made me resort to using Raspbian Linux, installing Mono on that, getting a OWIN ASP.NET server running on that, that listened to postings on a WebAPI endpoint, employing a modified C library to actually drive the pins to make the LED go, editing files, setting permissions, all via command line stuff. This brings another issue to light that is a problem from both an architectural and a practical viewpoint. The Raspberry PI2 had to run a HTTP server. The phone running the app listening to the Band data needs to know the IP address of the PI2, which implicates they must be more or less in the same network space. In addition, running a server on a small device is not desirable in any way at all as it also implicates security issues. Imagine having to set passwords and/or certificates on all your devices. And it’s hard to demo as well. A kind of magic black box in the middle that would take care of this problem by receiving data and distributing it to clients. It’s the kind of diagram typically drawn by a branch of people who tends to net big salaries by painting happy stories in the client’s mind - and, with the warm fuzzy feeling of a job well done, drop the actual problem of getting these magic boxes to appear out of thin air on the desk of some hapless unsuspecting developer. These people tend to call themselves architects, but I think marchitects would be a better word. Believe me, I’ve done architecture myself, I know how this goes. But I digress. 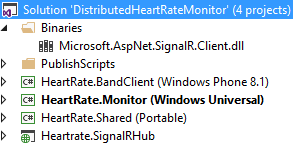 Make a Windows 10 Universal Windows Platform app, and you get an app that can display a heart rate from your Band on any device – a phone, a Surface (or any other PC), a Raspberry PI 2 or any other device capable of running some form on Windows 10 - anywhere in the world. And the net result really hammers home the concept of the Universal Windows Platform. I just deployed the app to three totally different types of devices and… it just works. It almost feels like cheating. A Portable Class Library that contains some classes that are shared by the various projects. I opted for making a Windows Phone 8.1 Universal App to actually drive the code that receives the actual Band data for two reasons: first, my main phone is still Windows Phone 8.1 and I still use my Band every day and second, it is a nice way to demonstrate how similar Windows 10 UWP and the ‘old’ UAP code now is (and share code between it). To open the whole solution and deploy the Windows 10 apps you will need VS2015RC (of course), but I can only get the 8.1 app deployed correctly on my phone by opening the same solution with VS2013 and deploying it from there. 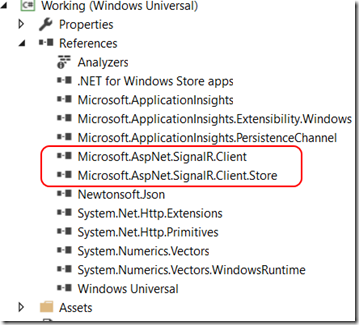 There is an issue with Signal/R and Windows 10 UAP – you will need to do some fiddling with referenced assemblies to get it working – that is why there is an Signal/R client assembly in a Binaries solution folder. For details see this post I did earlier. This basically says: expose a method “PostNewRate” accepting a parameter of type “PulseData” to a clients, that upon being called notifies all clients (including the caller) by calling a method “NotifyNewRate” with that same PulseData as parameter. 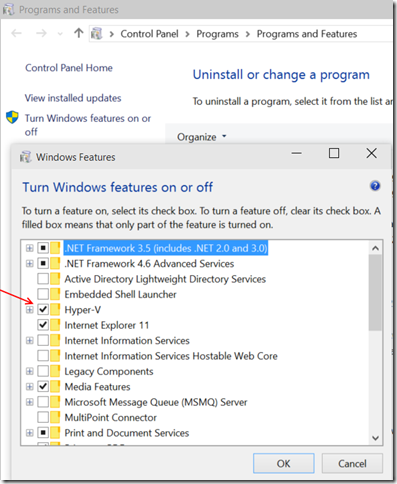 Note that NotifyNewRate is not a stronly defined method – it’s dynamic. 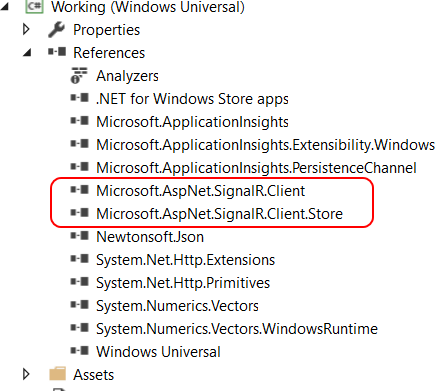 Signal/R is just going to assume it’s there on the client. If it’s not, it won’t crash or something. It just won’t do anything. 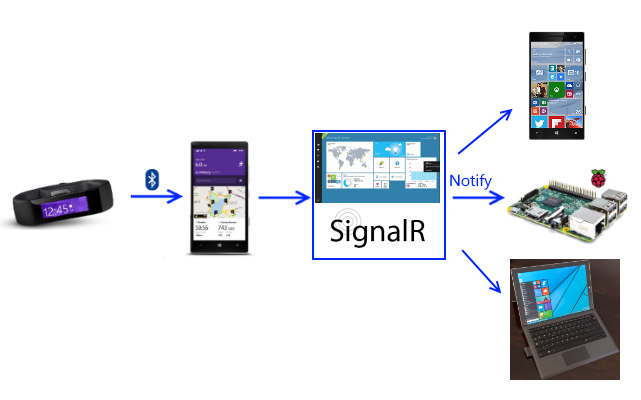 Having used Azure in it’s beta days, this really blew me away – you can just publish this to Azure with a few mouse click at some URL you like (provided it’s not already taken), and you have a fully functional Signal/R hub capable of distributing a heart rate to any Signal/R client on the world. Done. I wish every magic box sold by marchitects was so easy to set up. As I explained in February, a Microsoft Band does not give you a pulse every time your heart beats – it rather posts at a quite regular interval what your current heartbeat is. So in order to let something blink or flash at the rate of a heartbeat, we actually have to calculate the blink rate ourselves. As you will see, the blinking does not show your actual heartbeat – blinks will happen at the same rate as your heartbeat. More or less. Stealing my own code from February, I have created a simple generic Blinker class that raises an event every time a blink should occur based upon the heart rate supplied to it. It’s basically an endless loop, that runs until it’s stopped. If the last update was less than 5 seconds ago, it will raise an event, wait for 60000ms divided by the beats per minute – and then fires the next event. If it does not get updates after 5 seconds, it goes into a 10-seconds polling mode. It’s nearly the same thing as last time, except now it’s only raising an event “DoBlink” in stead of actually flashing a LED. You can see the LED and circles blinking at 74 BPM first (in blue), that for some reason my hear rate goes over 100 according to the band and the color of the flash becomes green - and faster, too. This was not intentional, but a happy coincidence when I was shooting the video. I define this class to be a Singleton. The Sunfounder’s three color LED I used last time red pin is connected to GPIO5, the green pin to GPIO6, the blue pin to GPIO13 and the buzzer’s pin to GPIO16. Based upon the heart rate it selects a different pin and thus the LED color changes. Initializing a pin is not exactly rocket science either. First you initialize the Gpio controller, then you open a pin, set it’s drive method to output, and write an initial “Low” value to turn in off. If you intend to be able to run this app on a device that may not support a Gpio controller, like a phone or a PC, you might want to check the actual presence of the Gpio controller type before actually calling it.You do this using the Windows.Foundation.Metadata.ApiInformation‏.IsTypePresent method as displayed. Notice the check if gpioCtrl is set – the IsTypePresent may have prevented that. But if we are running on a device that actually has a GPIO board, then get the right pins, set their value to high (blink! tick! ), wait 200ms, and set them to low. As easy as that. <TextBlock TextWrapping="Wrap" Text="UWT Heart Rate Displayer"
I create a new Heart rate listener – that is the thing that listens to heart rate data coming from the Azure Signal/R hub – and I initialize the LedSoundOperator (that will drive the pins) and a Blinker (that will raise events at the heart rate received from Azure). 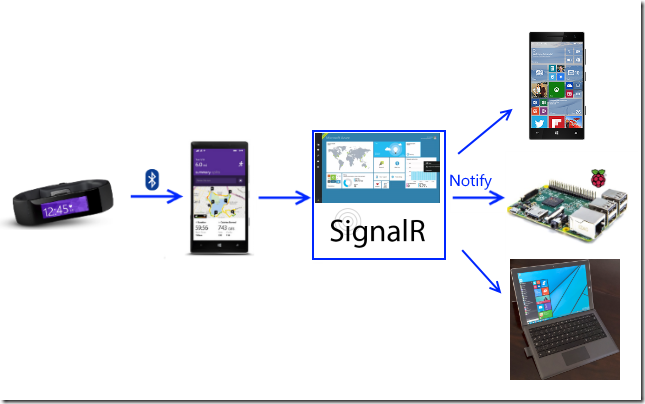 When the listener gets new data from Azure, it will turn it to the blinker. 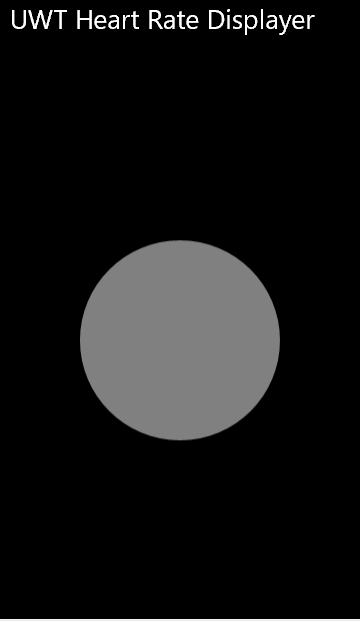 When the blinker raises an event, the method DoBlink will actually blink the LED and make the buzzer tick by calling the LedSoundOperator and by flashing the circle on the screen. 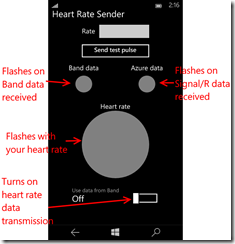 This is a simple app that listens to the Microsoft Band heart rate data coming in and simply pushes it Azure. 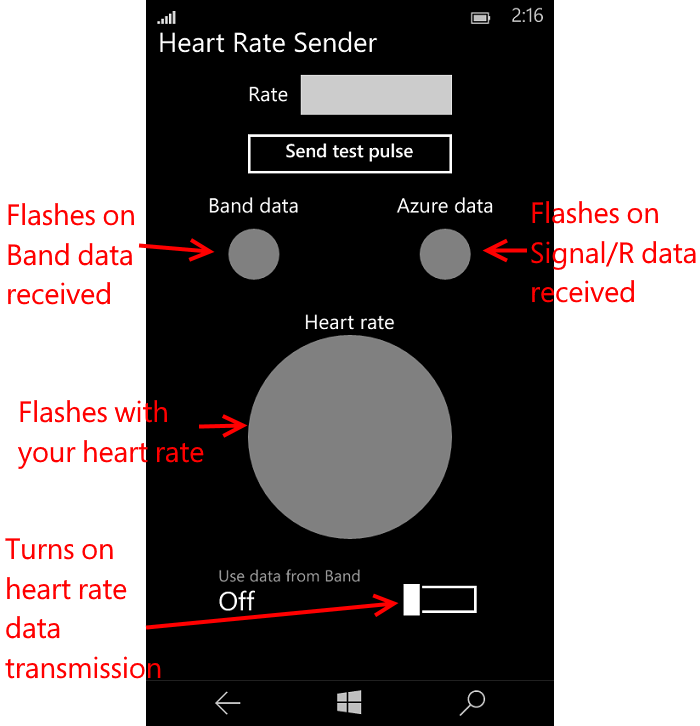 To make some monitoring possible, I actually added here as well the circle that flashes at your heart rate, as well as two little circles that flash yellow when Band data is received or data from Azure comes back (to the very phone that sent it). My sincere thanks to Irmak Tevfik for writing this article explaining that or I would probably still be scratching my head now. 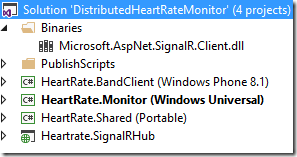 With some very basic stuff published on Azure and utilizing the power of the Universal Windows Platform apps I was able to write a distributed system for displaying my heart rate – using not only one code base but a single app that can be deployed on a range of devices; devices that could basically be everywhere on the world, as long as they have internet access. This really shows the power of current and near future Microsoft technology, making things that used to be extremely hard just very very simple. If I understand this right, this would even be able to run on XBox One and HoloLens, although I am not quite sure a gamer would like to see a big circle flashing on his console, nor would a HoloLens user like to see that more or less blocking his field of vision. But the point is that using these technologies it becomes very easy to connect a lot of devices very easily using one type of app. There are some issues still to be addressed in this solution. 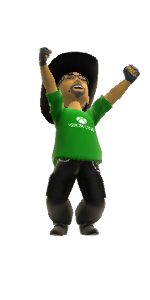 Basically everyone can post to the hub now and everyone can connect to it, so this opens great possibilities of completely destroying an on-stage demo. You clearly need to be sure that not everyone can post heart rate data to your hub or, if you want to make this available as a cloud service, at least make sure no-one get’s other people’s data pushed to it. There are several ways to achieve that, but that’s beyond the scope of this post. I actually have to credit my wife for thinking of an actual practical application of this crazy demo, for when I showed this to her in my typically overenthusiastic geek way, her reaction was not the typical geeks’ wife “well that’s nice dear” but “so if I understand you right, I can make a doctor listen to my heart rate even if I am on a holiday somewhere far away?” :). Additional information: Could not load file or assembly 'System.Net, Version=2.0.5.0, Culture=neutral, PublicKeyToken=7cec85d7bea7798e, Retargetable=Yes' or one of its dependencies. The system cannot find the file specified. And I was not the first one, as can be seen on the Github issues page and this Stackoverflow page.This has nothing to do with Silverlight 5, as is suggested in the comments. Apparently there is some NuGet target mismatch. I don’t quite understand the finer points, but I have found a workaround. 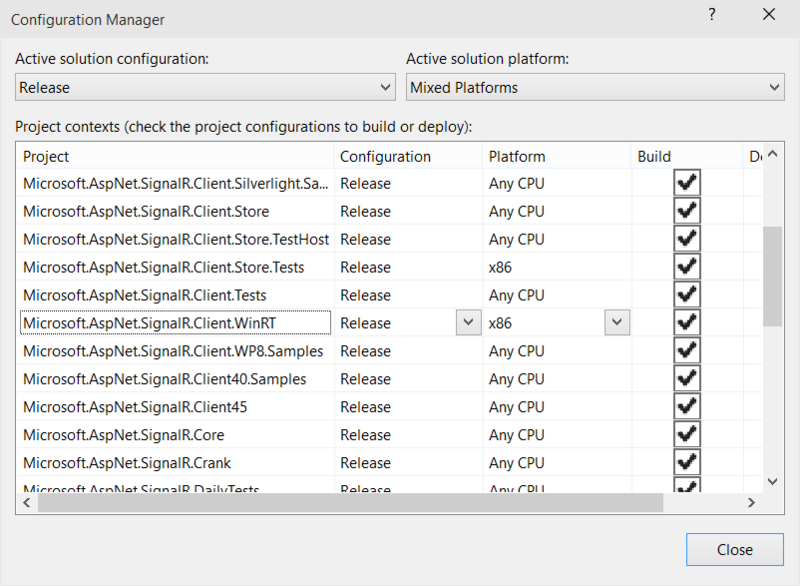 I cloned the SignalR repository from Github. 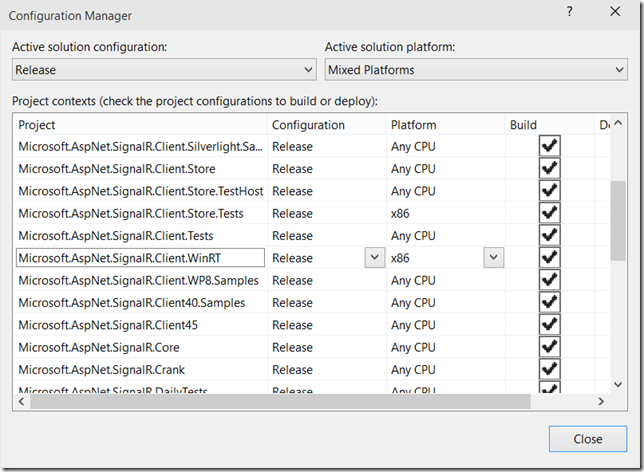 When that was done, I opened the Microsoft.AspNet.SignalR.sln using Visual Studio 2015RC. In the configuration manager, I looked for the same project again, and changed the platform from x86 to AnyCPU. For some reason that takes quite some time to complete. You will still get an error :), but that’s because there’s no actual Signal/R hub running on www.microsoft.com. If you point this code to a real Signal/R hub, it will work. I have tried on a PC, a Windows 10 mobile phone, and a Raspberry PI2. Demo solution with both the working (‘”Working”) and non-working app (“Kaputt”) can be found here. If you don’t feel like repeating all my steps and just want to grab the assembly you need, get it directly from github here. I had inadvertently installed the Android Emulator, and there are apparently some issues with that. No amount of removing selected parts, repairing of modifying could fix it. So I went for the drastic solution: I uninstalled everything that remotely looked like it had something to do with VS2015RC, including the duplicate entry of the Windows Phone 8.1 emulators. 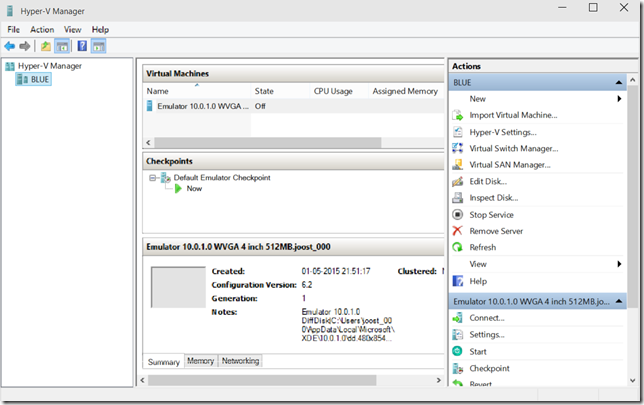 Then I opened the Hyper-V manager, removed all virtual machines there of Windows Phone 8.1 and 10 devices And I deleted also all virtual switches. 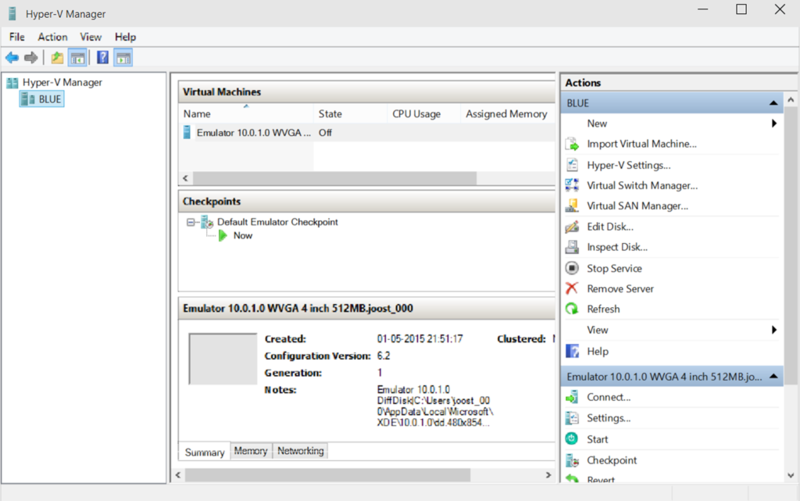 Now at one point the Hyper-V manager did not allow me to delete a virtual switch so I went for the bigger kill and removed all of Hyper-V by going into Programs and Features and uninstalling Hyper-V itself, and all the comes with it. This requires the PC to reboot. 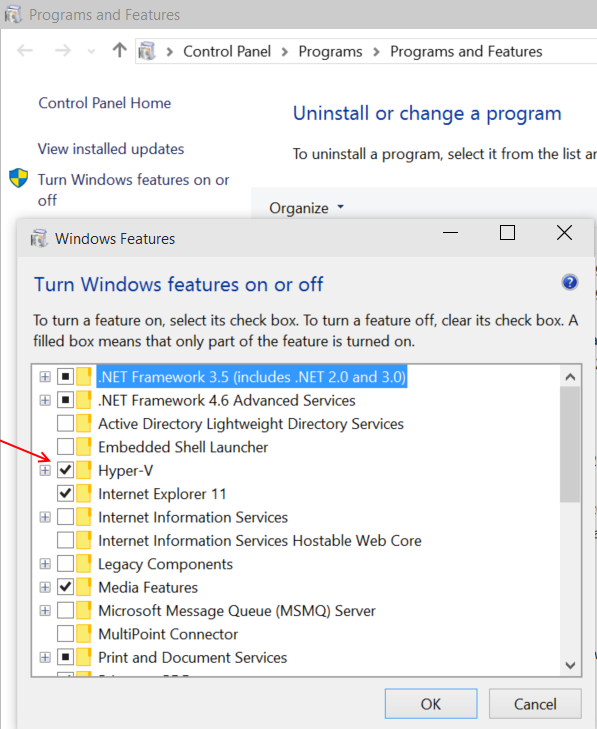 After the reboot, I re-enabled Hyper-V again (which requires another reboot) and then I installed Visual Studio 2015RC again, sans the Android emulator and the cross-platform development kit, and then at last my Windows 10 emulators showed up – and they also now have internet access, albeit it takes them a minute to get it. Your mileage may very, but this worked for me.